This is the short abstract dating back to 2002 which discusses a dog with Japanese cedar pollinosis that had oral allergy syndrome (OAS) after ingesting fresh tomato. So, what the heck is OAS to begin with? We might look at it as an immune system that’s an over achiever. For instance, it treats pollen like a foreign invader and because there are some proteins in fruits and veggies that are similar to those in certain pollens, they get treated the same way – by attacking and trying to flush them out of the body via discharges, inflammation, etc. This cross-reactivity between pollen and foods doesn’t produce problems in most people or dogs, but it can be a tough thing to figure out when it does happen. And frankly, if it happens to your own dog, I’m pretty sure you won’t care if s/he is in the majority (statistically) or not. You’ll just want answers and some help with the problem. Some dogs may become itchier, some may have eyes that tear after eating a certain food, and some will show a sign that I’ve seen over and over again – licking the air, or rubbing the muzzle until it’s inflamed pretty badly. It’s almost as if their mouths feel itchy (which is how people with oral allergy syndrome sometimes describe what they feel). 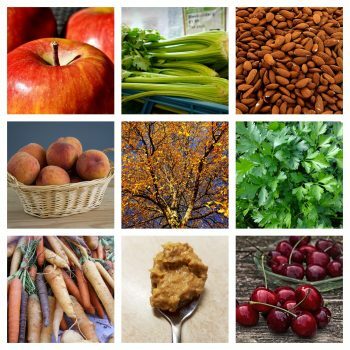 An allergy to birch pollen may also mean an allergy to carrots, celery, parsley, pears, apples, plums, peaches, kiwi, cherries, apricots, hazelnuts, fennel, carraway, soyabean, peanuts and almonds. An allergy to grass may mean a reaction to tomato, melon, peaches, swiss chard, oranges, celery or peanuts. Allergy to Mugwort may also cause a reaction to celery, parsley, bell pepper, black pepper, cauliflower, cabbage, broccoli, garlic, peaches, caraway, fennel and coriander. And while most people know that an allergy to ragweed can translate to a reaction to chamomile and echinacea, it can extend to melons, cucumber, bananas, zucchini and sunflower seeds. Does your dog have itchy paws? Read this to get some help with this problem.